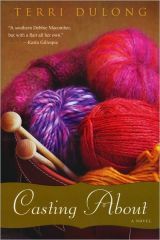 Casting About is the second of Terri’s Cedar Key series of woman’s fiction with romantic elements. A series that portrays real life women’s issues with just a touch of magic to spur the emotions. On a tropical island off the coast of Florida, the weather flip-flops between sun and rain nearly as fast as the changes in Monica’s newlywed life. Monica doesn’t want children and doesn’t have a problem caring about her husband’s ten-year old daughter, Clarissa. She lives in another state. It’s easy to be polite for a couple visits a year. The calendar hasn’t exhausted its first year of wedded bliss when Clarissa is court ordered to her father’s custody. Monica does her best to match her conscience with her real feelings as she experiences life with a child whose top need is love. During a few occasions when frustration leads the scene, Monica’s beloved deceased aunt makes a discreet showing to help calm the fires. Everyone can use a little magic once in a while to keep the spark of love burning, or to find where it’s hidden. A fun and enlightening read!